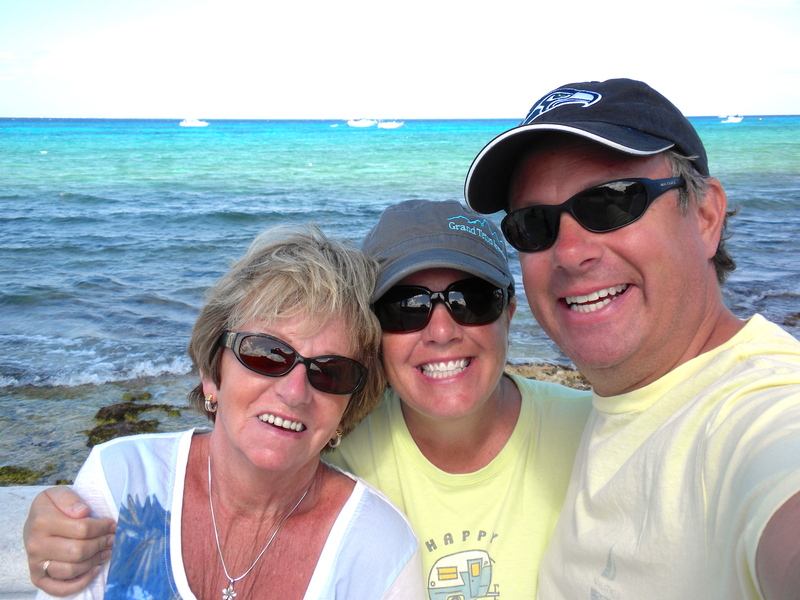 We headed north from the Keys and picked my mom up at the Ft. Lauderdale airport. It had been since Thanksgiving so it was so great to see her! 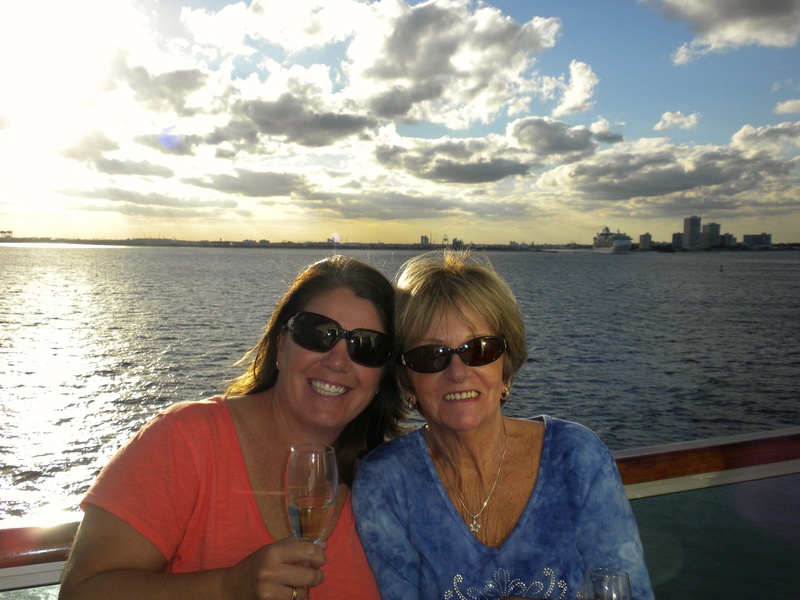 She had wanted to come visit us somewhere in Florida and somehow we landed on a cruise. 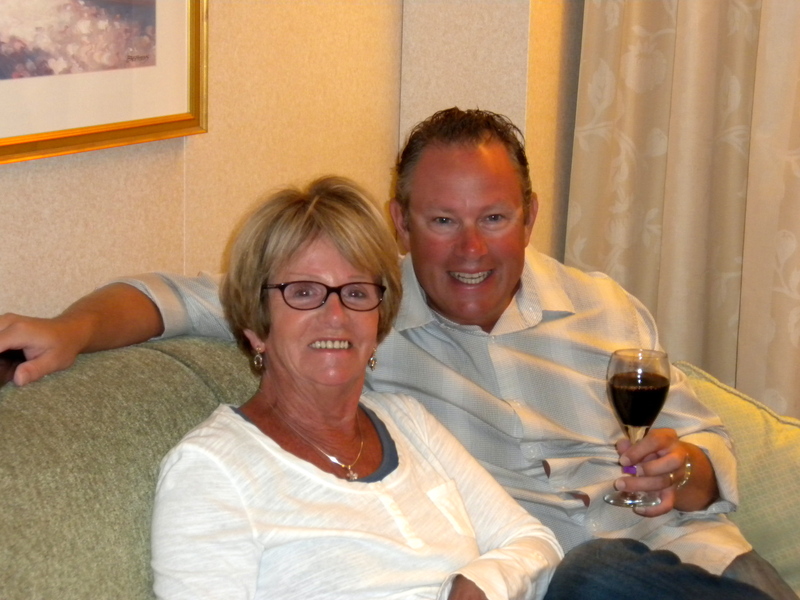 We stayed in a hotel for the first night, then headed to Port Everglades in the morning to board Ruby Princess for our 9-day Caribbean Cruise. It was the perfect chance for her to relax and get some much-needed vitamin D and for us to spend time together. 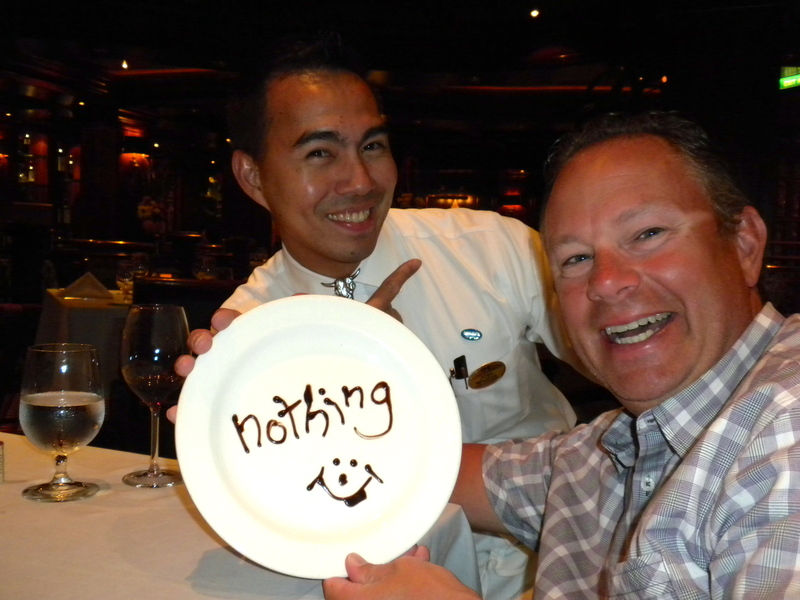 We did a whole lot of nothing! 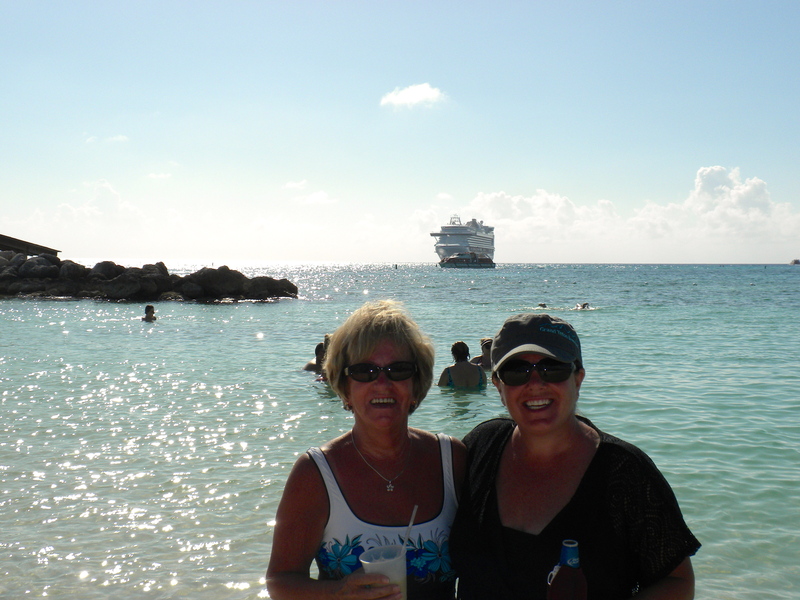 The itinerary only had 3 ports (Cozumel, Grand Turk and Princess Cays) so we had ample days at sea, which we liked. A lot of pool time! A few highlights were Bingo (mom won! 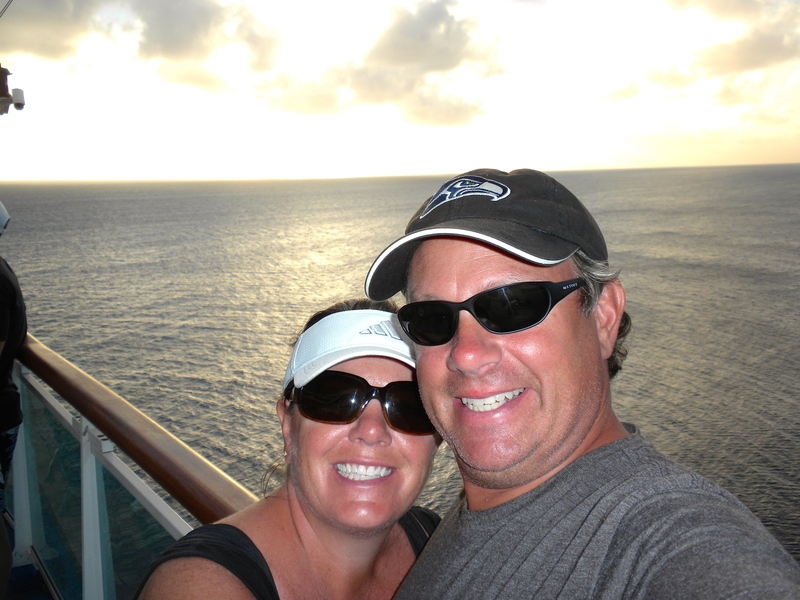 ), nightly wine before dinner, hanging out at Jack’s Shack in Grand Turk, Tequila tasting in Cozumel, getting our steps in everyday, talking up the Seahawks every chance we got and our final lunch on the beach in Ft. Lauderdale before dropping mom back off at the airport. Very hard to say goodbye after such a wonderful time together, but it really was a great vacation. Mike & I headed back down to Key Largo to retrieve the MoHo and get set-up and ready for S U P E R B O W L!!!!! We did come back to find something wrong with our fridge. All the food had to be dumped and we are using coolers until we can get a repairman out on Monday. Maybe I am loosening up, because really this isn’t even fazing me….progress! 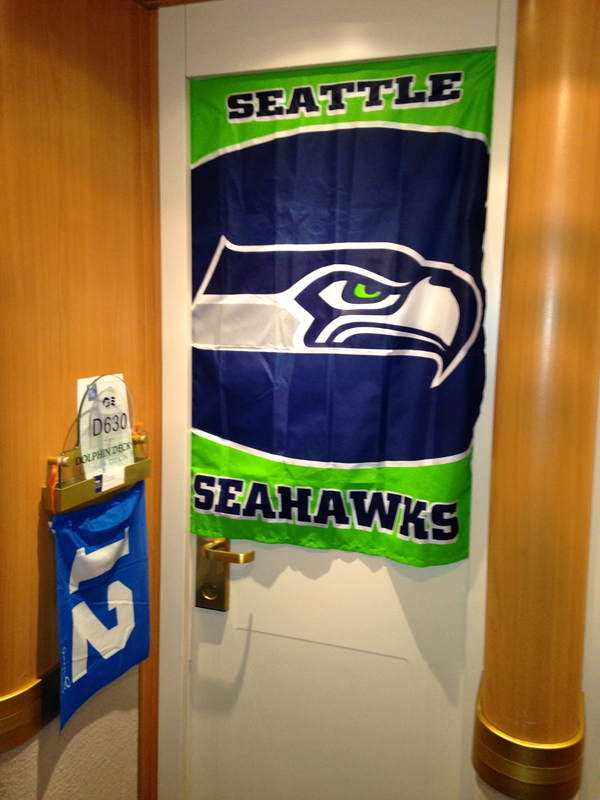 This entry was posted in January 2014 and tagged bingo, Cozumel, Family, Grand Turk, Princess Cruises, Ruby Princess, Seattle Seahawks, tequila on February 2, 2014 by Traci. Moving to our new spot at the campground has made a huge difference. We actually have had room to spread out and we back right up to the water. A perfect place to kick back in the evening for sunset and morning for sunrise. 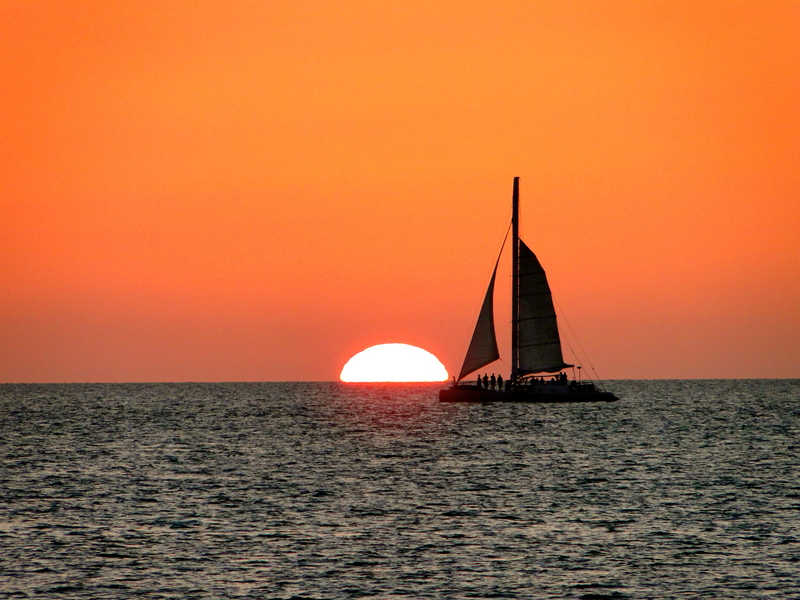 This second week in Key West we have definitely been in relax mode! We have been cooking more in the MoHo and I have been getting in my exercise and reading a lot while Mike continues to fish. Our new spot at the campground! We found a sandy beach – yay! It was a beautiful day so we packed up the chairs and cooler and headed out. The beach itself was pretty littered with seaweed/debris and the water was very rocky; we had to have sandals on. But, it was a great place to kick back for the day and read my book. Mike tried fishing for a bit, but no luck. This was the most touristy thing we did this week. 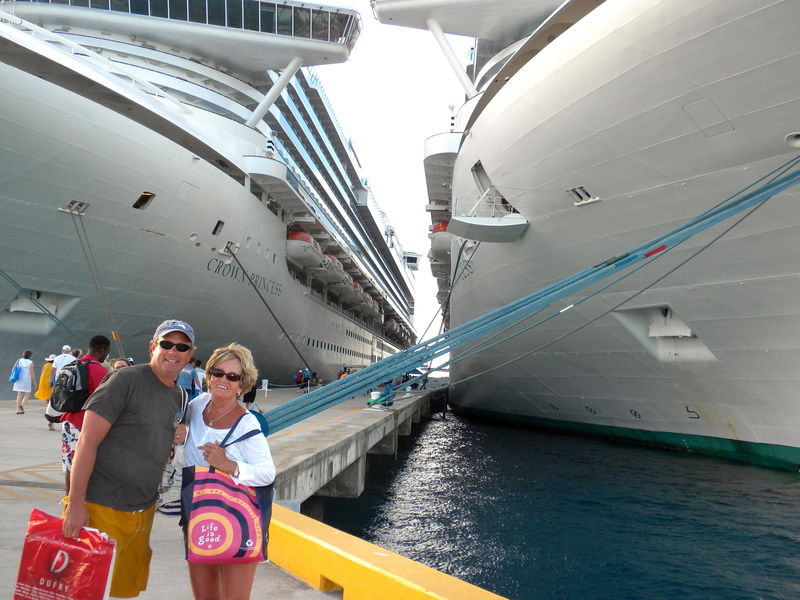 We waited for a non-cruiseship day so that it wasn’t so crowded, then went into Key West to get the obligatory photo. Hard to believe we are only 90 miles from Cuba! 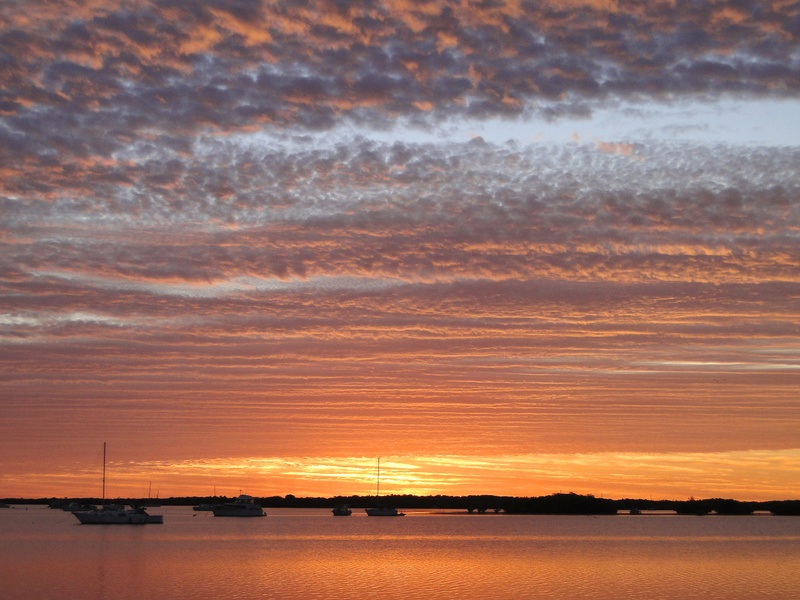 Since we had already seen the amazing sunset from the land, we decided we wanted to see it from the water. We opted for Sebago and the Appledore V, an old schooner. There were only 8 other people onboard with 3 crew and they provided appetizers and cocktails. This sounded better than the crowded party barges we had seen go out. It wasn’t a crystal clear day and the wind had definitely picked up, so we weren’t sure how it was going to go. I actually had to make a last minute jacket purchase because I didn’t dress warmly enough. Well, the clouds made for a fantastic sunset. We had a great time getting to know our fellow passengers and crew and would highly this company. This was the perfect day! We started off at the local Seafood & Arts Festival down the road. It was a small little event, but they had a lot of fresh food, some local craft booths and a great beer garden. $5 for the first beer with a souvenir mug, then refills were only $3. And you didn’t have to stay in a restricted area to drink. What a great concept! 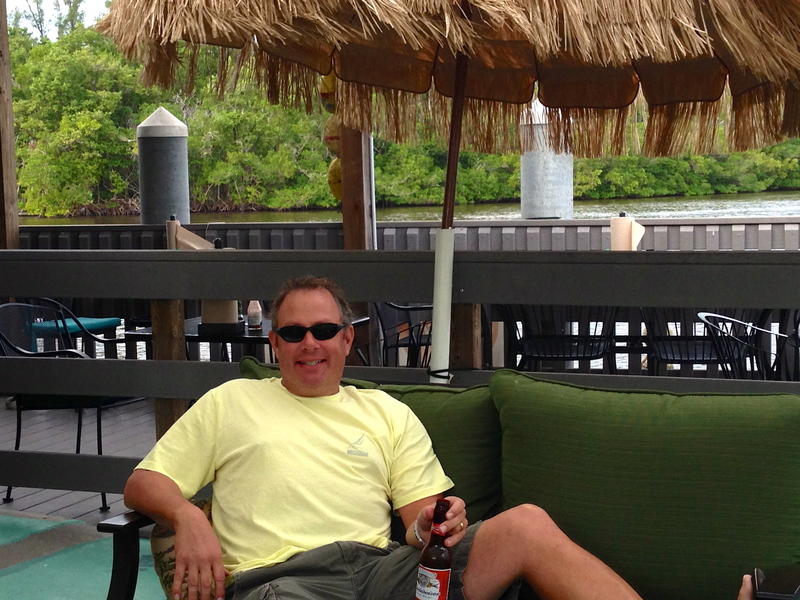 Then, we stopped at a local bar right on a marina, Hurricane Hole, with a great outdoor area. We had a late lunch and ended up watching the first half of the Denver/New England game. A fun group of people there. Then, it was time to head back to the MoHo to gear up for the big game. We ended up watching it outside and had a lot of interest from our neighbors and other campers walking by. One guy actually sat down and watched the last quarter with us. I was pretty nervous the entire game, but felt the relief and excitement along with everyone else on that final play! Mike promptly got up and sounded the MoHo horn. It was close to 10pm, but had to do it! 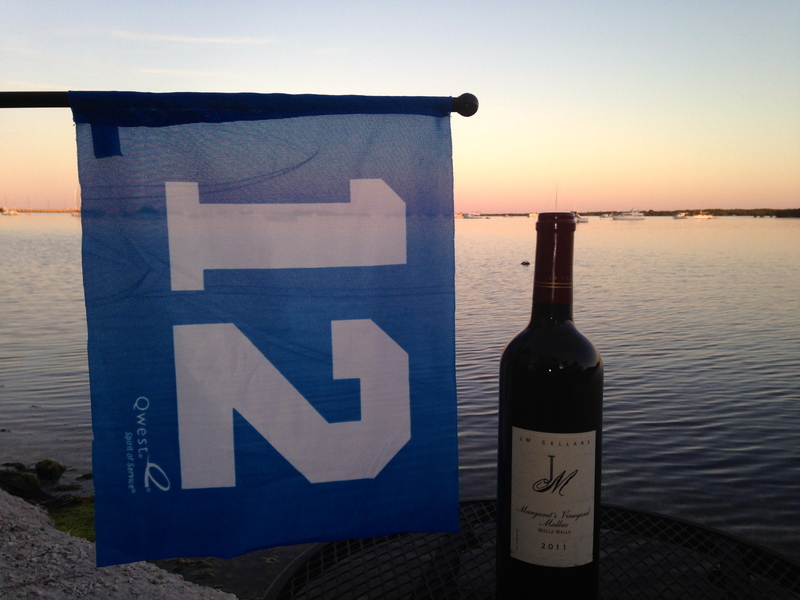 We sent this to our favorite Washington winery, JM Cellars to post on their FB page. This was about an hour drive for us away from Key West, but so worth it. Someone had recommended this park for kayaking, so we decided to go for it. We tooled around in the beautiful blue/green water for a few hours, then decided to take advantage of some beach time. This beach was about the same as the one we had been to before with lots of seaweed, but there was a sandbar to wade out onto. It was about 50 yards of knee high water with a very sandy bottom. Much better! When we got back to the car I noticed something on the windshield. 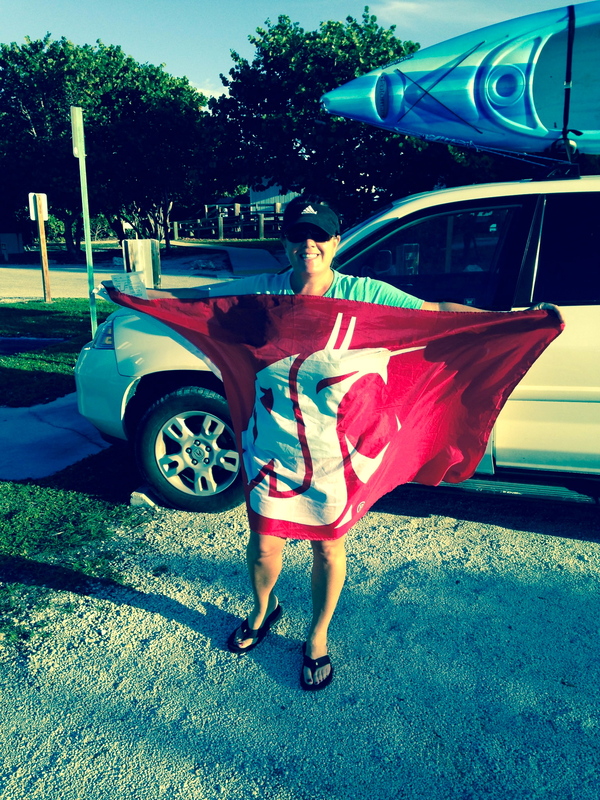 There was a note and full sized Coug Flag. It said, “Of all places to run into a fellow Coug. Enjoy!” He must have seen my license plate cover. So very cool. I couldn’t believe it. I will have to pay it forward. 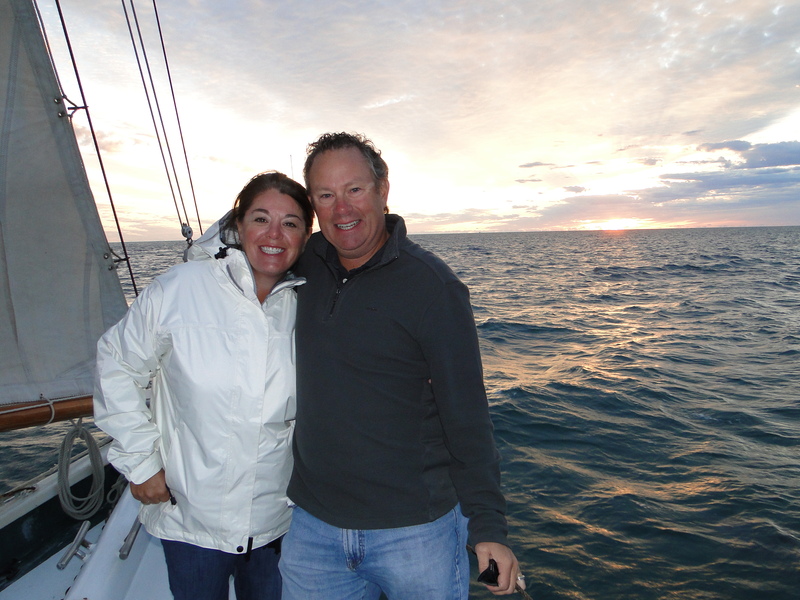 Mike had wanted to do this for 2 weeks so he finally booked a 6-hour charter with 4 other people. I stayed home and did some errands and more or less just relaxed. The boat caught 6 fish consisting of mackerel and dolphin fish. 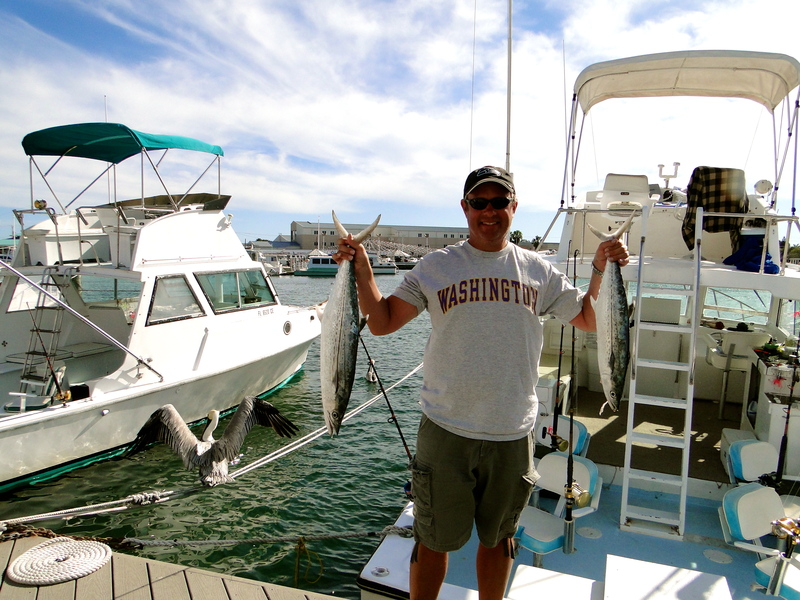 Mike reeled in two of the mackerel. It was a beautiful day out on the water and he loved it! Even brought home some of the dolphin fish to grill up. I think a fishing boat is in our future at some point. Today it is pouring down rain so it has been a good day for us to get packed up. 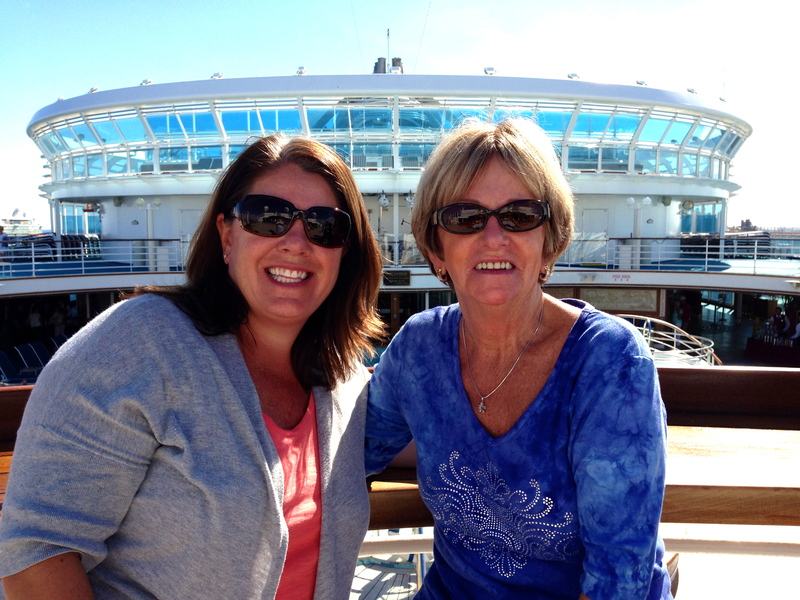 We head to Ft. Lauderdale tomorrow to meet my mom who is flying in from Seattle and then we get on Ruby Princess for a 9-day cruise on Thursday. 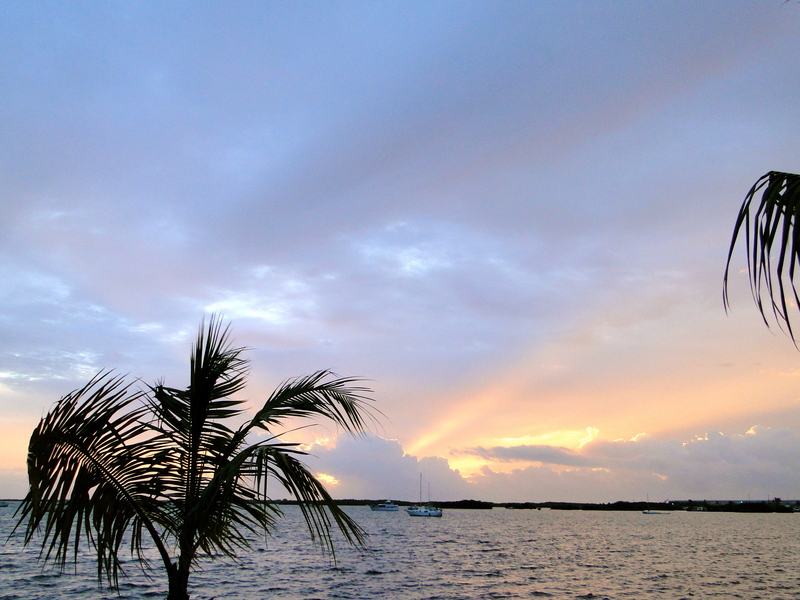 We will leave the MoHo in Key Largo where we have a week booked after the cruise. 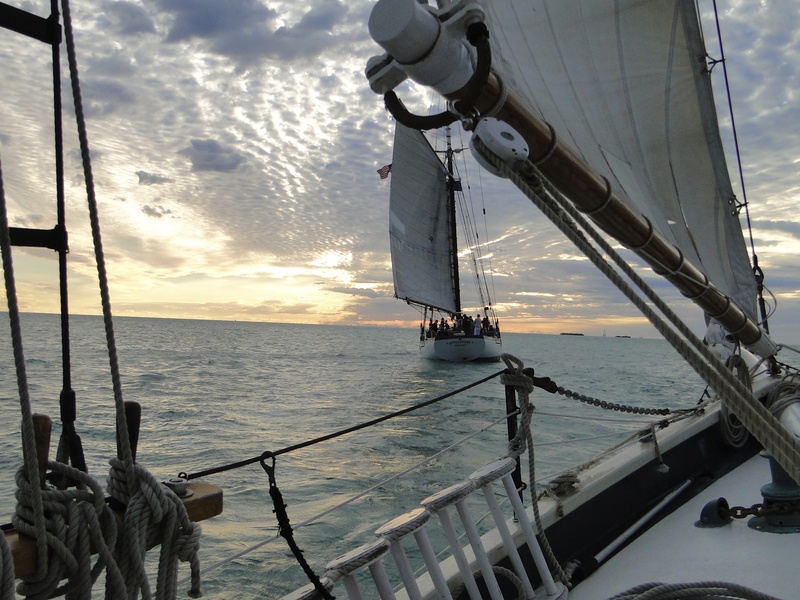 Bon Voyage Key West. 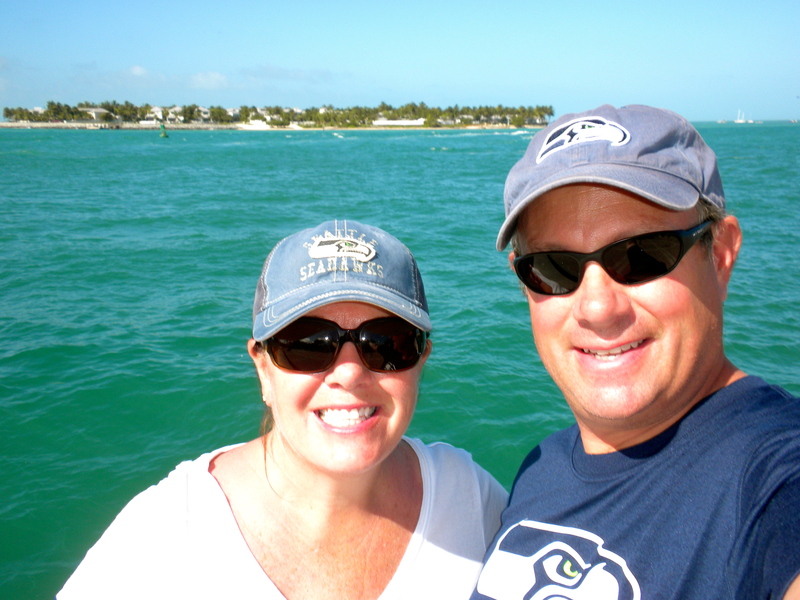 This entry was posted in January 2014 and tagged Cougs, fishing, Florida, Florida state parks, Kayaking, Key West, Seattle Seahawks on January 21, 2014 by Traci. 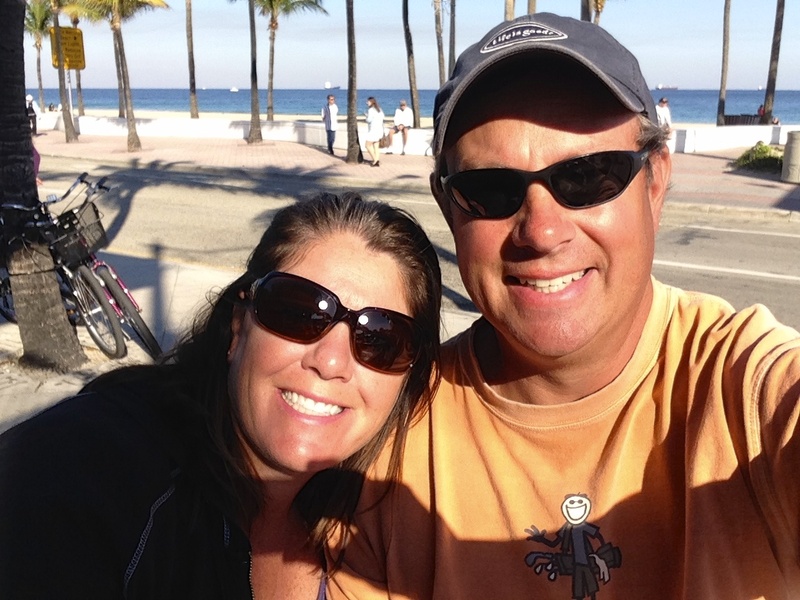 We have been in Key West for a week now, halfway through our stay here. This is part of the trip that we had planned quite some time ago and Mike spent a lot of time researching where to stay. 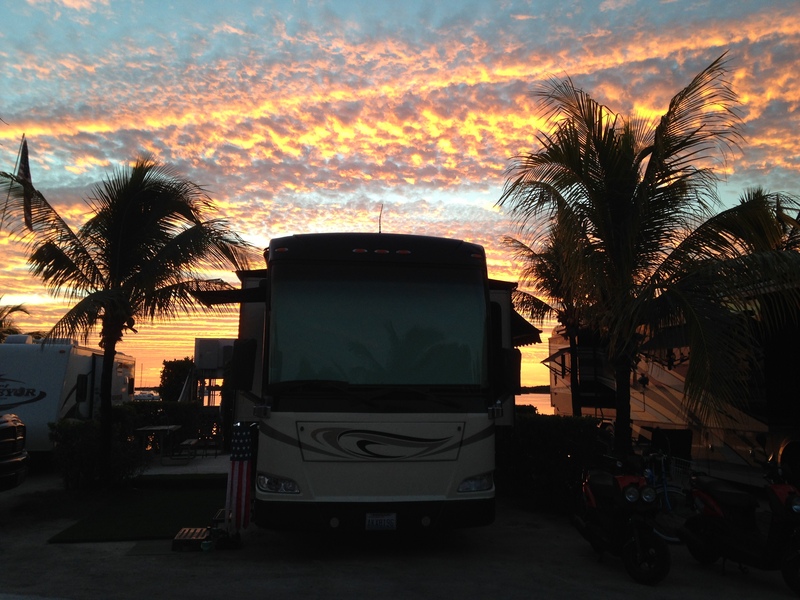 We landed on Boyd’s RV Resort because it was the closest to the town of Key West and we were able to get a spot on the water. Upon arrival, we were very disappointed. This place was a zoo, absolute chaos. The first spot they gave us, we couldn’t fit into. And, it wasn’t on the water. After talking with the office and going back and forth for about an hour, we got settled into a spot that would do, but still not on the water as we had expected. Disappointed to say the least, but they were able to find a water spot we could move into on the 14th. I think we have been spoiled with our last few parks, because this place just did not measure up. Crowded, extremely tight spots (we can’t even extend our awning), not paved and very noisy. We would not recommend this park. In fact, we tried calling around to see if we could fine another park, but everywhere was full. Stay tuned for an update when we move to our new spot. I am trying not to dwell, but that is not in my nature. Mike of course is doing better with it than me. Ok, so now that my rant about Boyd’s is out of the way, let’s focus on the fact that we are in Key West! This place is like no other. Blue, blue water and everyone is in full vacation mode. A relaxed, party atmosphere to say the least. Our first full day here, we decided to head into Key West to see what it was all about. The RV Park is at Milepost 5 and town is Milepost 0, so we are fairly close (the best thing about our park – location). There were 2 cruise ships in town, so it was busy and crowded. We parked and the first experience we had was seeing Guy Fieri roll down Duval Street in his red Camaro filming for Diners, Drive-Ins and Dives. He stopped at a light right in front of us. For those of you who know me well, I LOVE celebrity sightings! 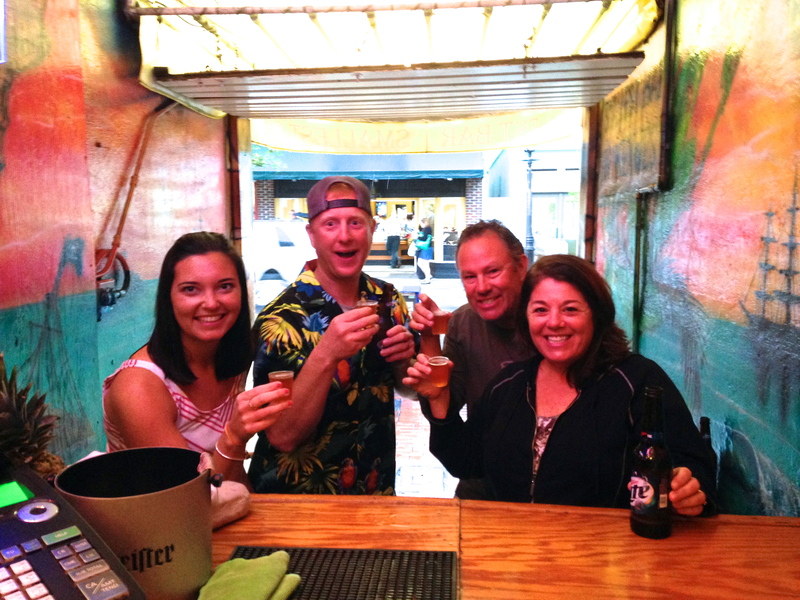 We then stopped in at Sloppy Joes (famous spot that Hemingway used to frequent) for a beer that turned into three. There was a live band playing, we met a couple of fellow RVers and ended up chatting with them for awhile. Left there and walked by a place on the street, the Smallest Bar, which really was the smallest bar. Mike could touch both sides of it with outstretched hands. There was a young couple there who we hit it off with, Joe & Kate from Toronto. A few more drinks and Fireball shots and that’s all she wrote. We ended up bar hopping with them the rest of the night and having dinner at Margaritaville. By the way, they have the same concept of “to go” beverages that New Orleans had. Needless to say, we did up Key West right on our first night in town. 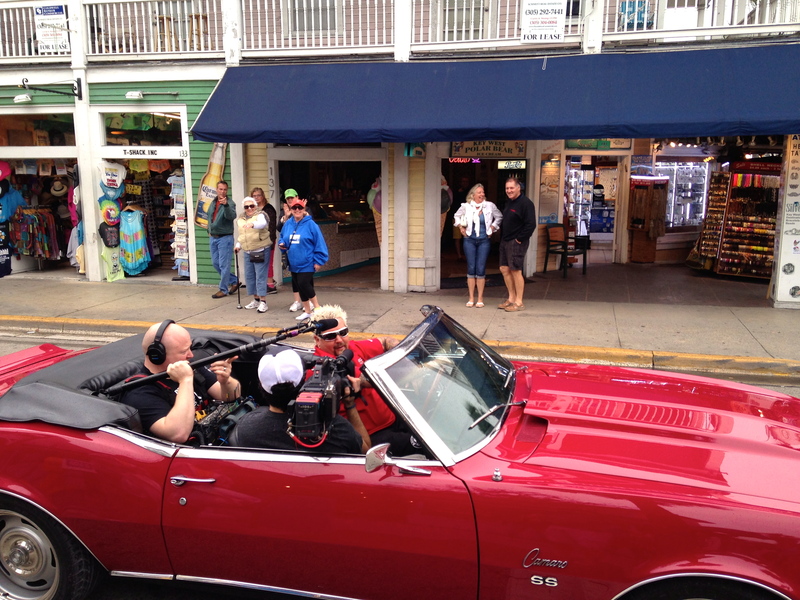 Guy Fieri filming on Duval Street! The rest of our time so far hasn’t been quite as crazy. We had to get that first night out of our system before we could hit a more mellow and relaxed mode. We have been back into Key West twice. 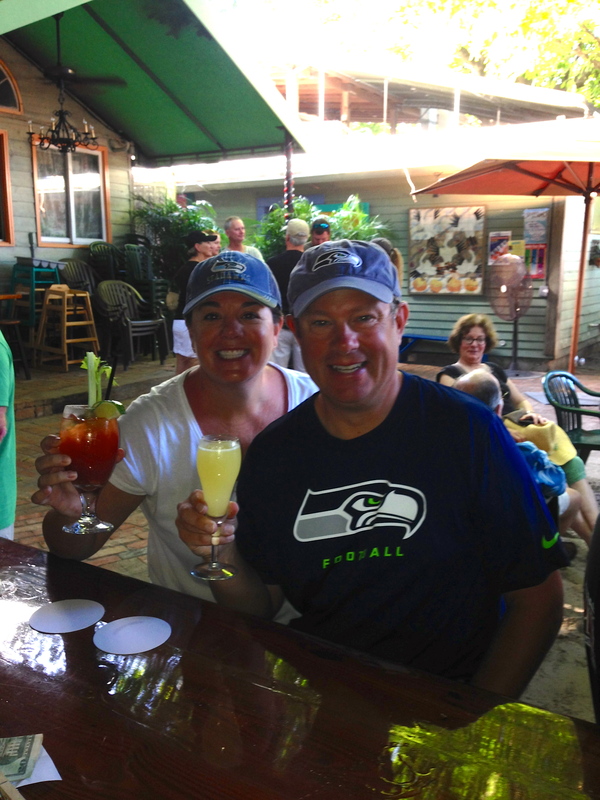 Once on Seahawks Football Saturday for brunch at Blue Heaven (highly recommended to us from Craig Gambino and it did not disappoint – banana pancakes)! We walked up and down Duval Street, then decided we wanted to watch the game from the comfort of the MoHo so we could utilize the DVR function if needed. It got a little interesting, but we came away with a victory!!!! Another day we went into town in the late afternoon for an early dinner at Fogerty’s, then to Mallory Square for the sunset celebration. The square is located on the south end of Duval Street and faces to the west. We were there on a Sunday night and the place was packed. Street performers everywhere. At about 5:55pm, we watched the sun disappear into the ocean and everyone cheered (see main photo at the top of this post). If you’ve never seen this phenomenon, it certainly is an incredible sight. This is a nightly celebration and I’m sure is crowded every night. There were also tons of boats out in the water, so we may look into a sunset cruise for another night to experience the sunset celebration another way. We have also had a chance to use the kayaks! One day we took them out right from the RV Park, which definitely was convenient. The wind kind of kicked up on us though, so made for a good workout on the arms to get back. But, being out on the water is just hard to beat. Another day, we drove back up Highway 1 about 5 miles to Geiger Key. The weather was perfect and the water was oh so blue. It was so clear and varied among 3 or 4 shades of blue and green. It is also so shallow in places; even hundreds of yards from shore, we could get out and stand in just 2 feet of water. 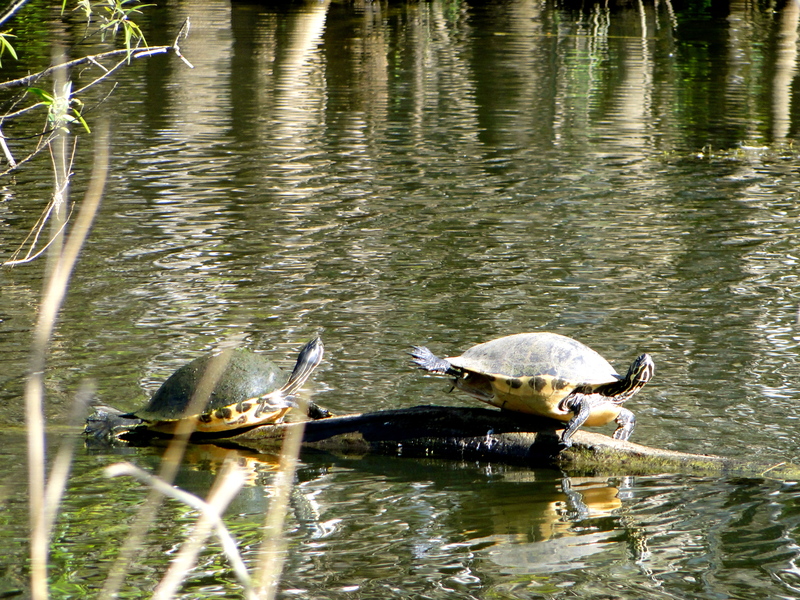 We saw a turtle swimming and tons of huge birds. Mike fished and got a few nibbles but nothing to reel in. On the way back to the take out spot, I had a manatee surface right next to me and it scared the doo doo out of me. This thing was huge and I thought it might tip me over. Possibly an over-reaction as they guys are apparently gentle giants and probably more scared of me, but it just really startled me. After we got back on shore, we continued to watch this guy surface, which was very cool to see! We’ve had a little bit of everything weather wise. Rain, wind, sun and of course the humidity. For the most part, it has been great weather though and typically in the high 70’s. Mike has been getting his fish-on daily and has been enjoying trying out different lures and locations. He typically gets up early and heads out for a few hours while I snooze away and have a leisurely morning. We have really settled into the laid back atmosphere! 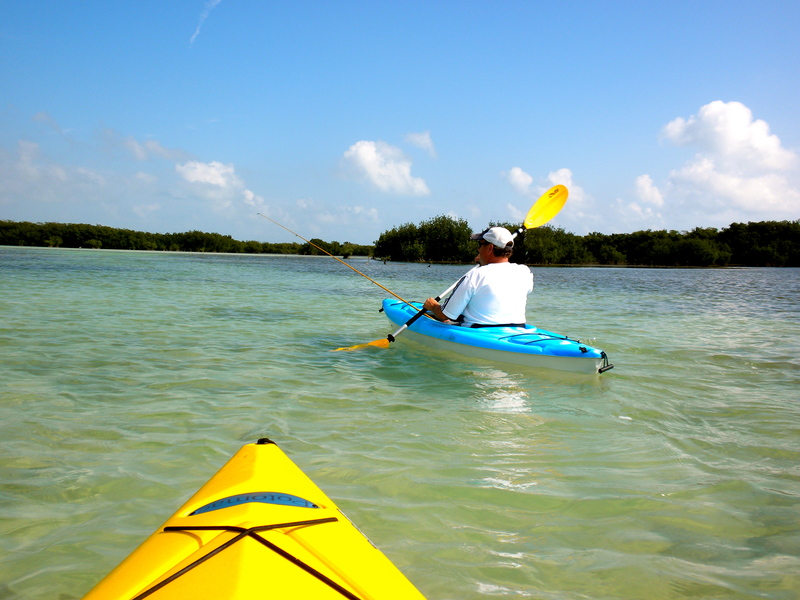 We are looking forward to another week here to continue to kayak, fish and explore new areas. 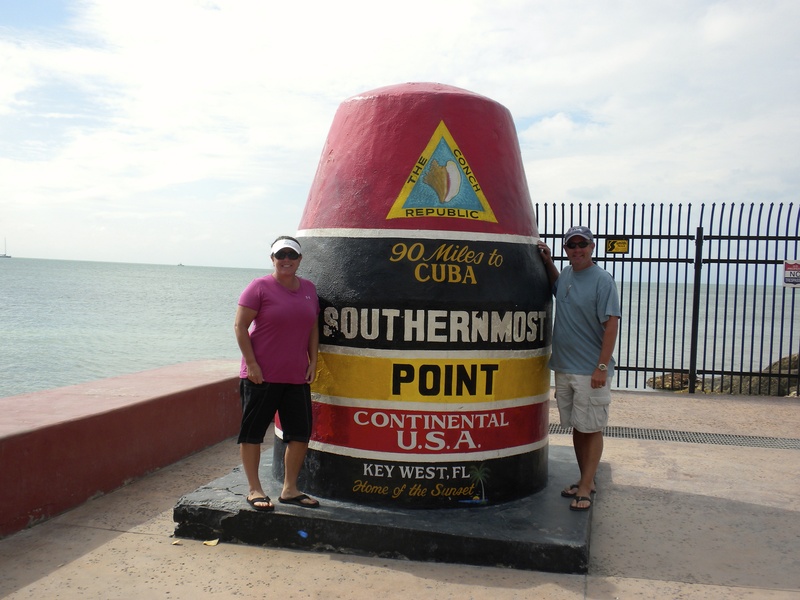 I’m sure we’ll head back into Key West a few more times, but there are so many other “Keys” to explore. 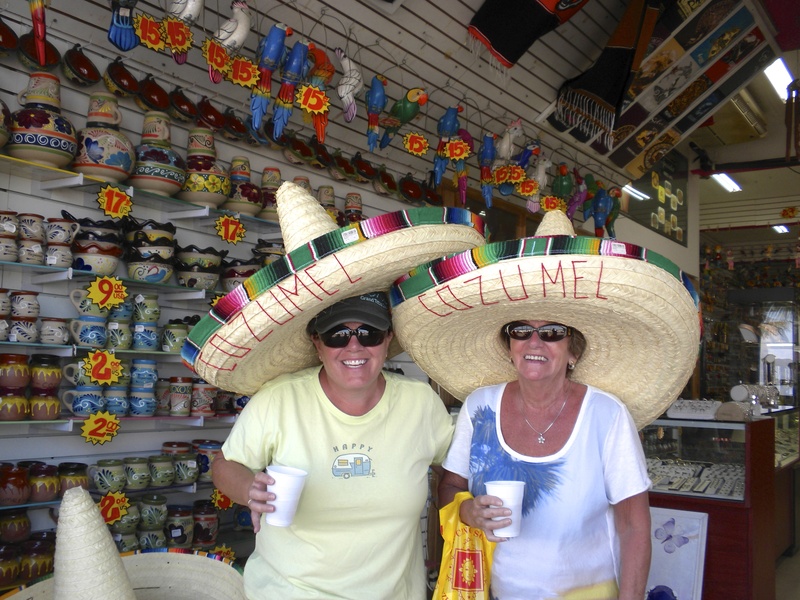 We are trying to balance the touristy stuff with off the beaten path experiences. One thing that has surprised me is there are not a lot of beaches. 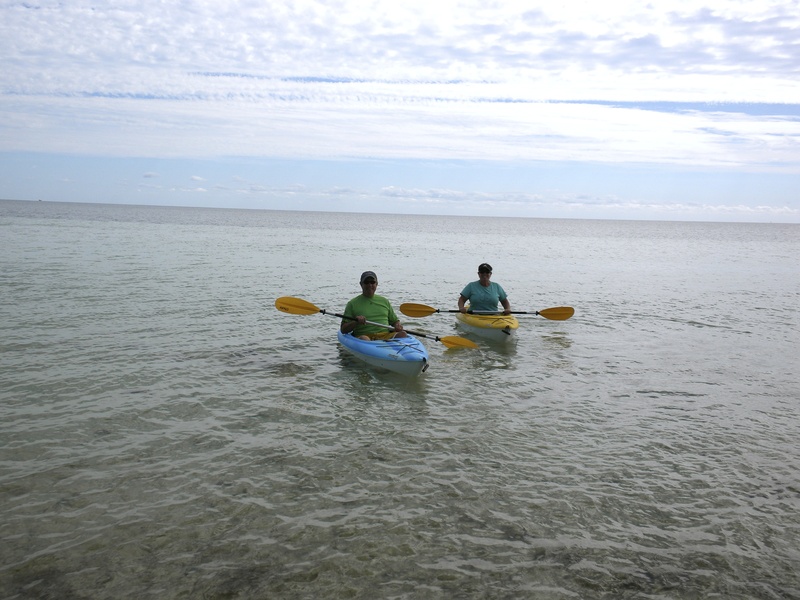 I had in my head that we would take the kayaks onto a beach and sit at an open-air bar with our toes in the sand. This is not the case, mostly marina’s/bulkheads to launch boats (there are A LOT of boats around here) and then the islands that are lined with mangrove trees. In fact, I haven’t seen anyone swimming from the shore, just people out in boats. Not a big deal, but just funny how your expectations aren’t always accurate. I hope the New Year is treating everyone well. My resolution is to continue to embrace what we are doing and try to let things roll of my shoulders when all doesn’t goes as planned. This is a challenge for me, but I’m working on it! 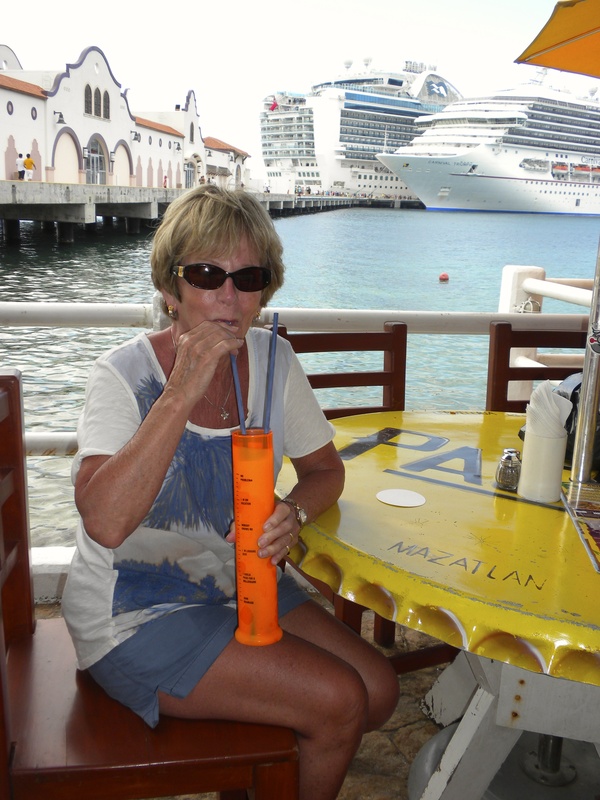 This entry was posted in January 2014 and tagged Duval Street, fishing, Florida, Guy Fieri, Kayaking, Key West, Mallory Square on January 14, 2014 by Traci. 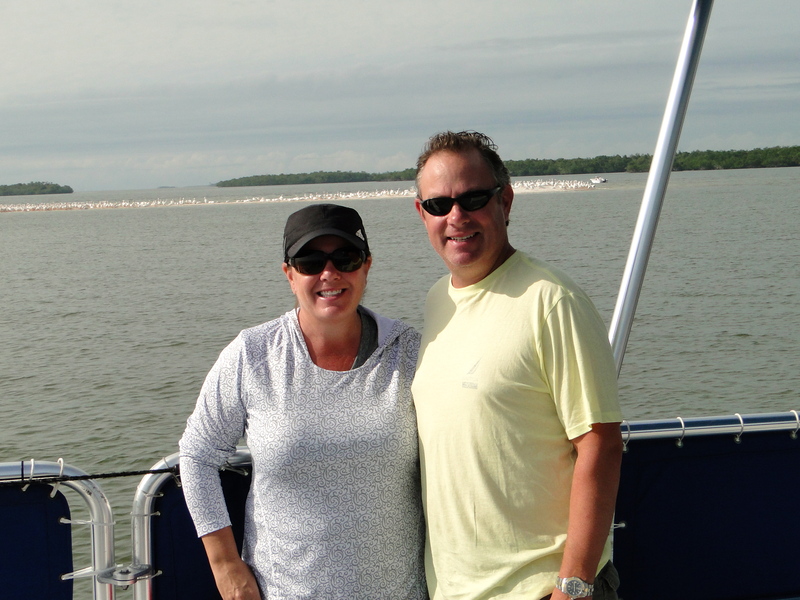 We headed out of St. Petersburg and kept going further south on the Gulf coast of Florida. 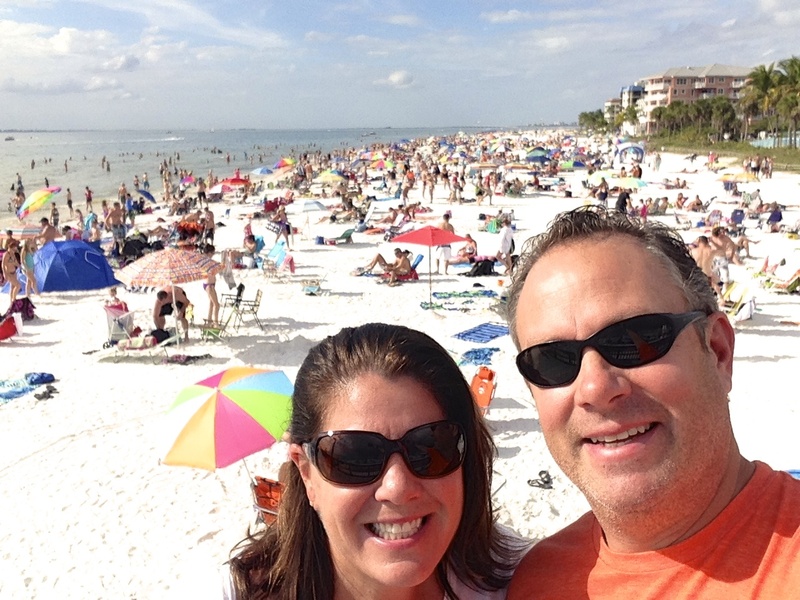 We drove about 3 hours to the town of Ft. Myers Beach, about an hour north of Naples. We arrived at the Gulf Waters RV Park, and checked into site #855 on a private little lake. This was another great resort, tennis and pickle ball courts, a big clubhouse with a pool off to one side, and the best part of all – huge wide sites to park on. We set up and headed over to the beach, across the only bridge in and out of the area, and it took some time with all the traffic. We pulled over and took some pictures, walked on the white powdery sand, I got my Florida fishing license at the local marina, then we decided to head home and make tacos for New Years Eve. A quiet night in sounded pretty good. We made it up to 11:00PM, and that was it, not bad for us! The next day we wandered back to the beach, and after searching for parking for 45 minutes, finally found a free spot in a city lot, as it was New Years Day. We went out to the beach and it was crazy how many people were out enjoying the sun, it was only 78 degrees! Grabbed a beer for a walk on the beach and then went to a little hole in the wall bar for more beverages and some food. We hung out and people watched for a while, then it was time to get back to the MoHo for the Rose Bowl and some real food – Chicken Wings! We enjoyed the days’ college football bowl games and turned in early. This area would be a great place to spend more time, but we were on a schedule to get to our next spot. The next morning, we left Ft. Myers Beach and headed to Everglades City, about a 2 1/2 hour drive, just the kind of distance I like! Along the drive, we were surprised by a road sign we saw frequently, “Warning – Panther crossing.” We have all seen the deer signs and elk crossing signs, but Panthers? We did not see any along the route, but it did peak our interest. We arrived at the Everglades Isle RV Resort around noon. When we pull in to most parks, we stop at the front to check, as we did here. We went into the office, and immediately realized this was not your average RV park. The office was just a tiny little corner of the massive clubhouse. After checking in, getting the MoHo set up, we wandered the grounds of the park. 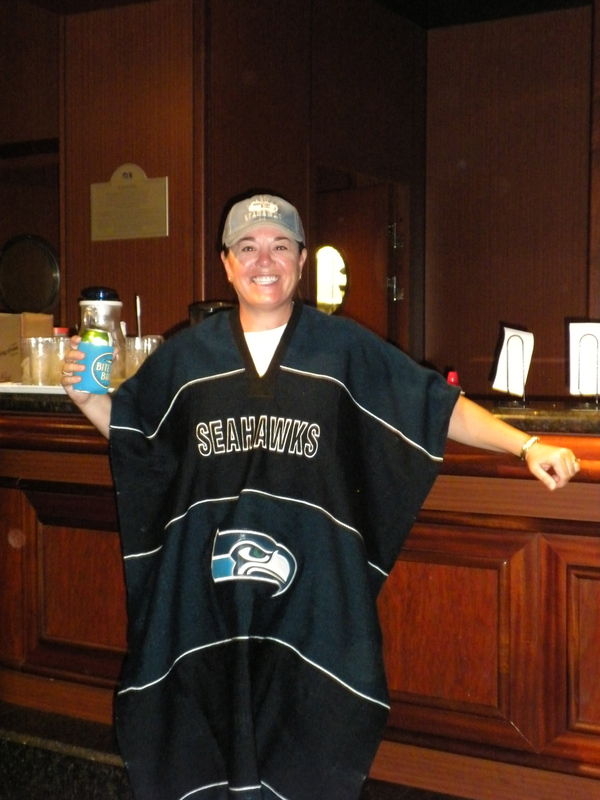 The clubhouse had it all; a full service bar, open nightly for happy hour at 4:30PM, nice shower facilities with complimentary towels, free laundry, a well-equipped gym, a movie theater and a nice little spa. The outdoor pool and hot tub were just off the main clubhouse, and there was a small mini service bar out there as well and a boat ramp. This place was top of the line. We returned to the MoHo and our site was perfect. We faced the Barron River, just 10 feet from the front of the rig. 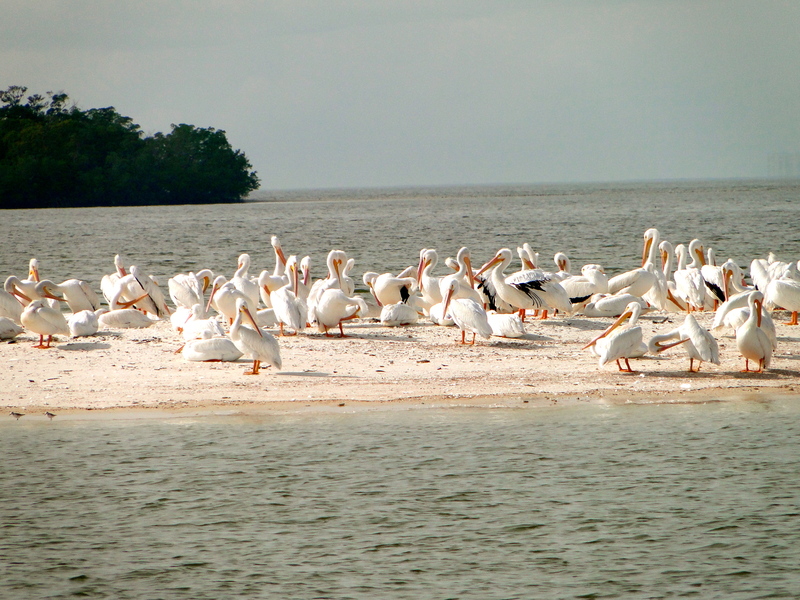 There were airboats coming and going up and down the river constantly, and tons of pelicans everywhere. Our site was one of the best we have stayed in yet. Plenty of room; very deep so we could set up anywhere on the pad and not feel too cramped, and very wide so we could put out our Dream Turf – the artificial grass we carry along with us. The only problem we could find here, were the No-see-ums. If you haven’t experienced these before, they are like mosquitos but worse because you can’t see them. Their bites turn into little red spots and they itch like crazy. We both got our fair share of bites. 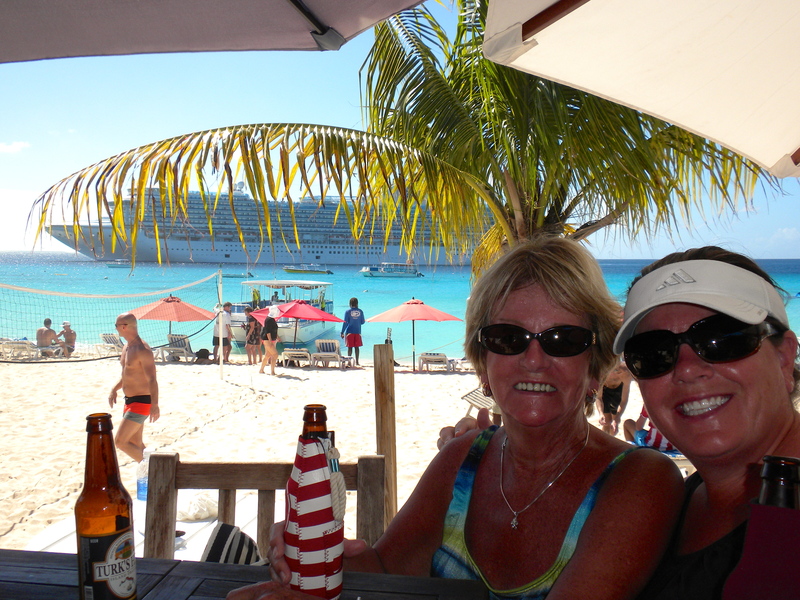 We relaxed for the afternoon and headed up to happy hour at 4:30PM and we were greeted by the bartender Sandy. She was staying just a couple sites down from us, and was working her first night behind the bar by herself, and she was perfect. We enjoyed getting to know her each night at happy hour and hope to meet up with her and her husband Gene this summer in NY. 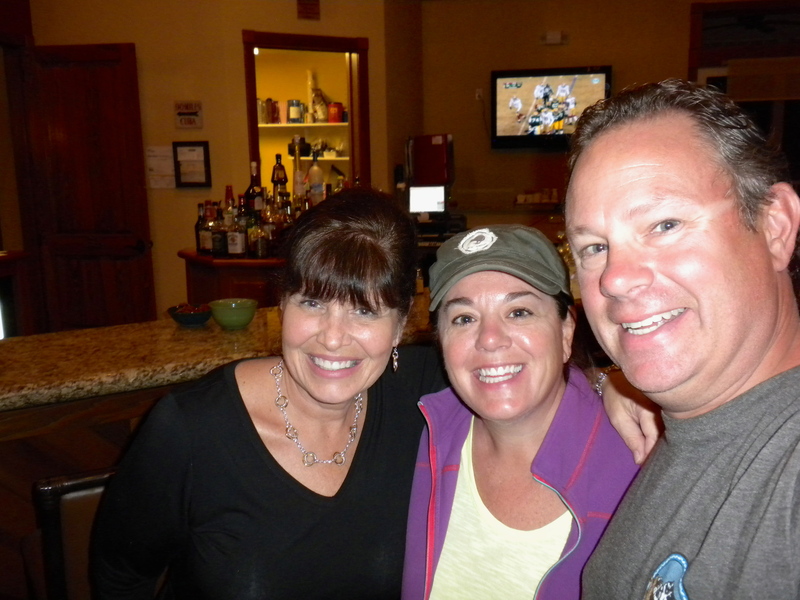 We headed back to the MoHo for dinner and catching up on some college football games. The next day we decided to take an airboat ride with Speedy’s. 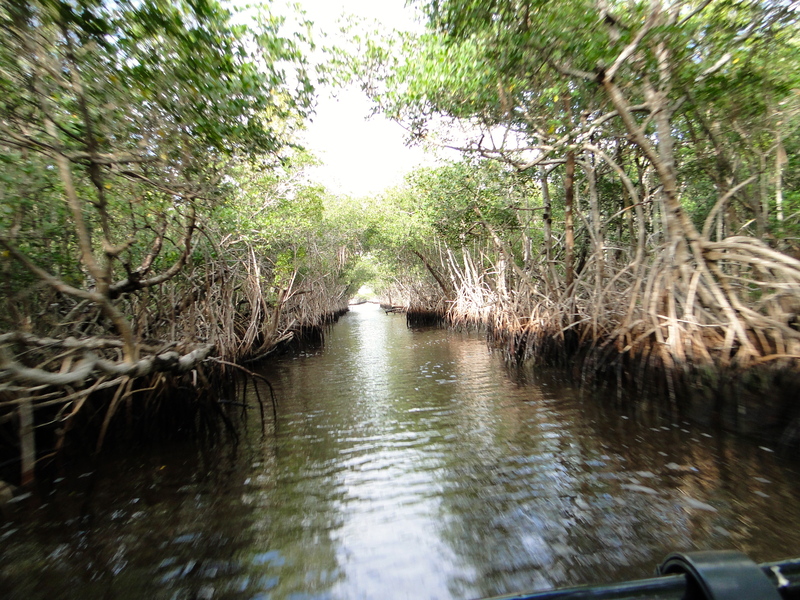 We got on board, and the driver took us back into the Mangroves, which are the main foliage here in this part of the Everglades. We meandered slowly through the tight, little, narrow passageways. Each turn it seemed like the route was getting tighter, but the captain knew his way. Then, he decided he had given us enough time to get used to the feel and sound, and he finally hit the throttle, and we are suddenly whizzing through the Mangroves! We emptied out into an open area and the captain did a full 180 and we stop on a dime! OK, now this was what we were expecting. We sped in and out of the Mangroves and grasslands for the rest of the one-hour tour, and then returned to the dock. It was pretty windy and cold, so no alligator sightings unfortunately. We headed back to the MoHo, headed up to happy hour and ended the night with dinner in the quiet comfort of our home. We were bundled for the ride! The next morning I headed down to the bait and tackle shops in town. I had been fishing off the dock in front of the MoHo when I have had time, and I was needing to replace some gear and find out how and what to use locally. (All my fishing gear is based on the trout/salmon fishing in the Northwest, not what is used here in Florida). 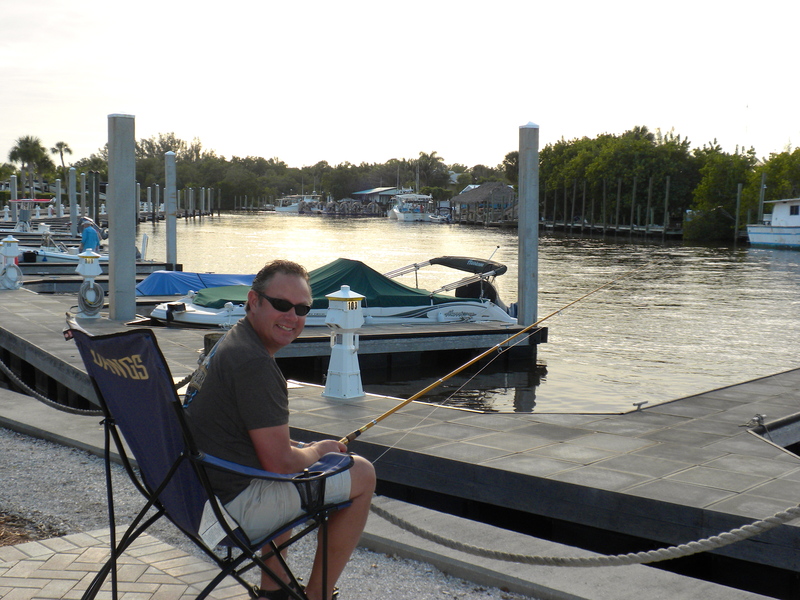 I returned and headed out on the dock, and just had a relaxing morning, and yes I did catch a couple Sheepshead. That day was cool, and the forecast was spot on, as the rains started around 11:00AM and it poured most of the rest of the day. We did a few chores around the MoHo, Traci got a massage at the spa, and then we headed to happy hour to watch the early NFL playoff game in the clubhouse. We headed to a local restaurant for dinner. Everglades City has about a dozen restaurants, and we were getting lots of info from our fellow RV park neighbors on what was good. Well, we missed that night, dinner was not worth finishing, let alone bring any leftovers home, oh well. Sunday we woke and it was much better weather. We relaxed in the AM and headed to a Cuban restaurant for lunch, just down the road in the next little town of Chokoloskee, another recommendation. 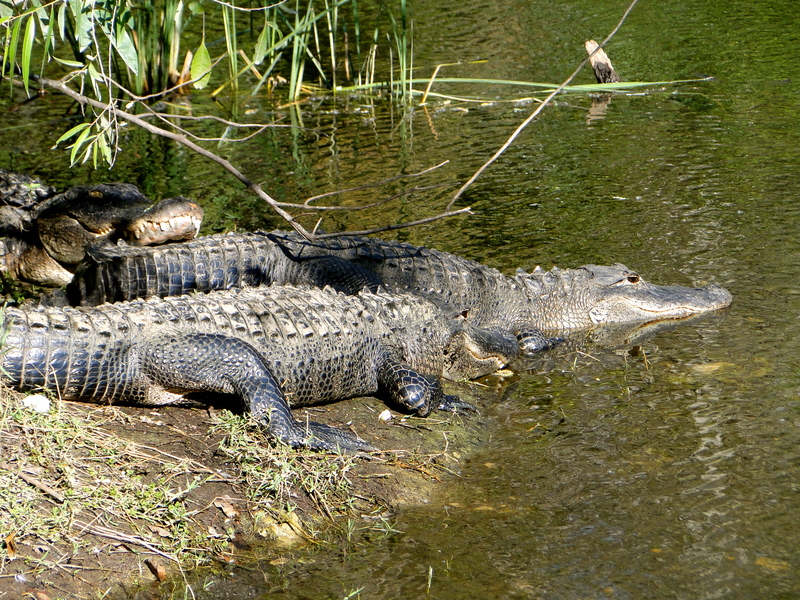 For the afternoon, we opted for a drive one our neighbors had told us about to see some alligators. We turned off Hwy 41 onto Turner River Road. There was a viewing dock set up for people to watch for alligators, birds, etc. We walked out on the dock, and there was not much to be seen, except for a ton of fish in a little wetland. (The Barron River we were staying on is very dark in color, as it mixes with the tides and the Mangrove leaves. These leaves stain the water a brown color, much like a tea bag, and it never is clear to see into). It was nice to see into some water, and actually see the fish swimming and all the plant life. We walked the length of the dock and thought we could see a small alligator off in the distance, but were not sure. Across the road about 50 yards, there were a few people making a bit of noise, so I headed over to see what was going on. Low and behold, there was a gator over there. I peered down to the area people were pointing, and this dude was huge! I would guess it was 13-14 feet in length, and that is no fish tale! 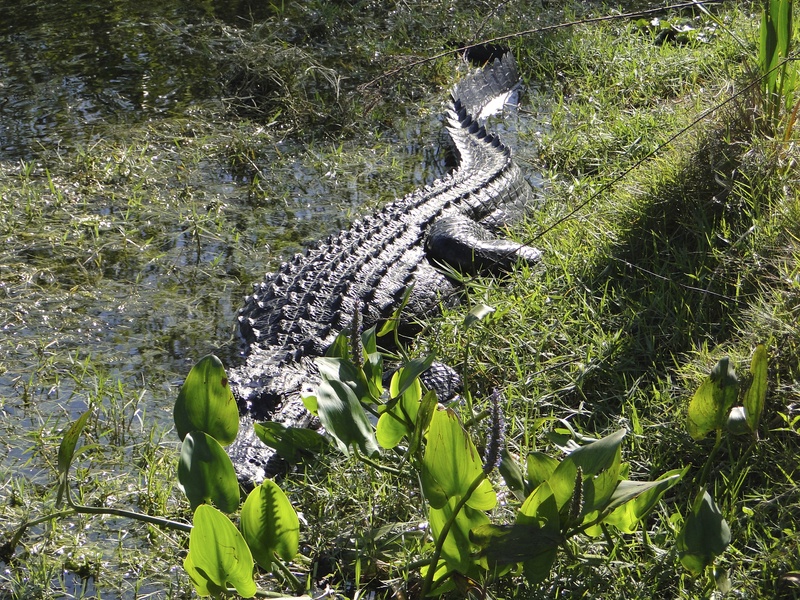 (One lady nearby said she was a lifelong Floridian and had not seen one that big ever!) 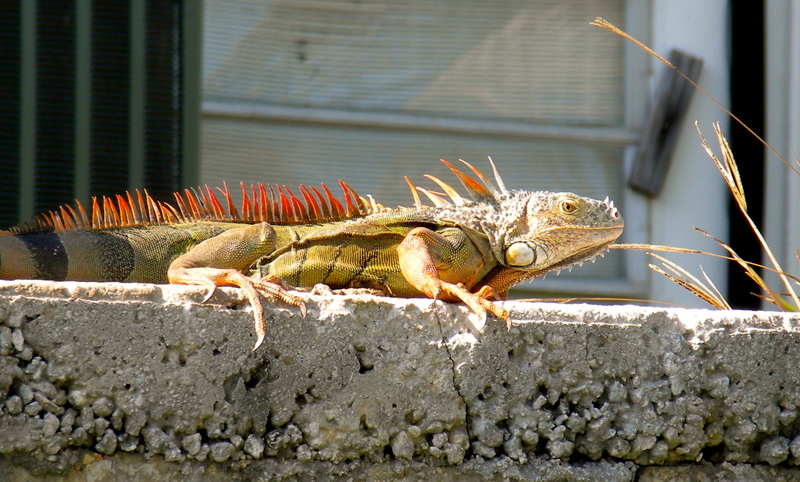 I positioned myself around the monster for some great pictures, keeping a safe distance, using the comfort of a bridge to view him sunning himself in the warm afternoon heat. We returned to the car and headed north on Turner Road. Alongside the road was a canal/river. 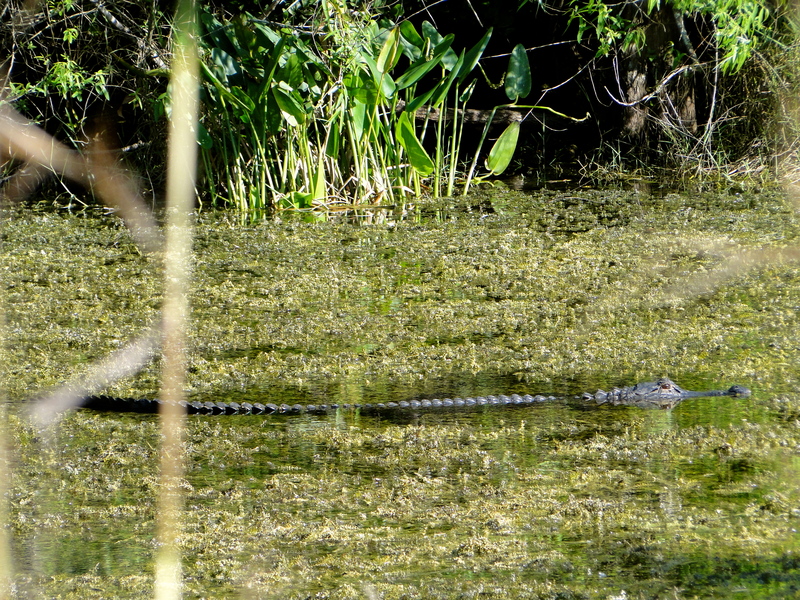 We saw hundreds of gators, dozens of turtles, and all sorts of huge birds. Many of the animals were just sitting on the rivers edge, as if they were posing for us, pretty amazing how much wildlife was here. We completed the 17-18 mile drive and headed back to the RV park, a great side trip and can only thank our fellow RV park neighbors for the inside tip. The next day, I did some fishing for a couple hours, Traci relaxed at home getting some of her to-do’s done and then we headed out for the afternoon. We never used the kayaks here, as the Barron River had some serious current, and we had talked to another couple that had actually become trapped by the current and not able to return to there vehicle. They had to flag someone down to help get them back to their car, so we decided to stay off the water. 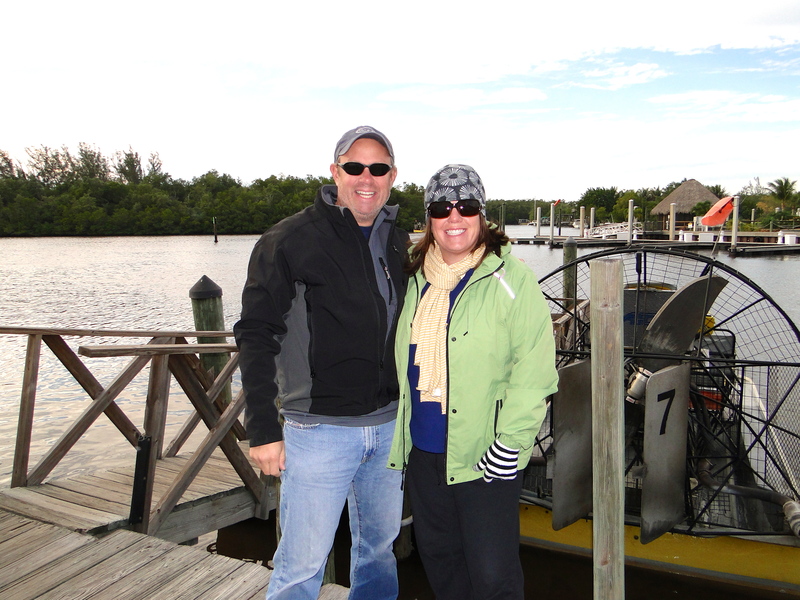 We went to the Everglades National Park and took a guided boat tour of the 10,000-island area, just between the coast and the Gulf of Mexico. The captain and narrator gave us a lot of good information on the water/landscape. 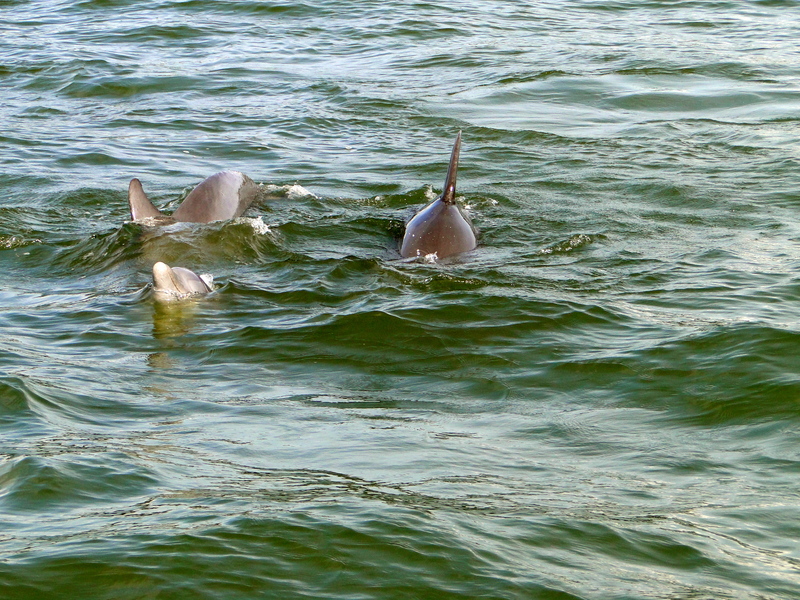 We got all the way through and out to the gulf, and were greeted by several dolphins feeding and playing. This was a great way to see this area, especially if you do not have your own boat. We returned to town, and headed to a late lunch/early dinner. We went to Camellias, another local place recommended by our neighbors. This was the best meal we had in town, by a long shot. We both were craving hamburgers, and they were prepared perfectly. 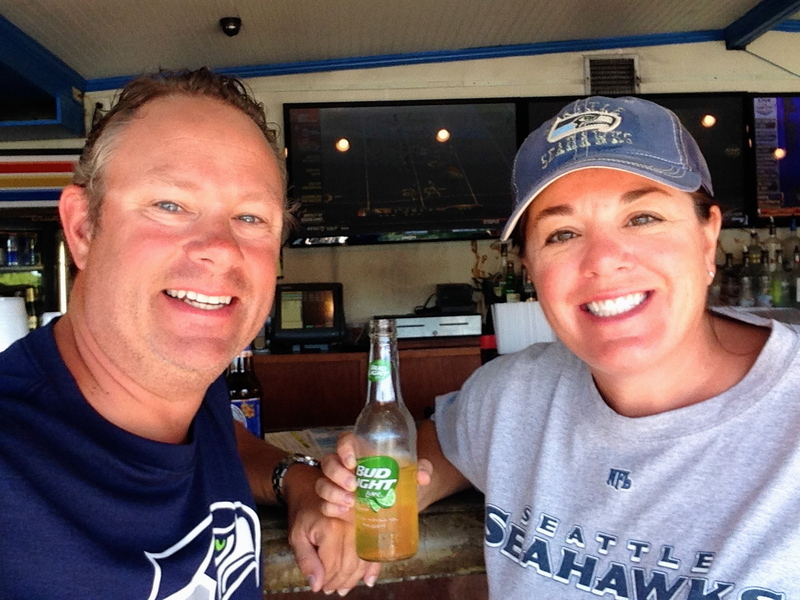 Washed the food down with some ice cold beers and it was a great ending to the day…talk about a “cheeseburger in paradise!” We returned to the RV park, and headed up for our last happy hour. It turned out to be the busiest night yet and we stayed for a couple hours, chatting with the rest of the RV park guests that came up that night. We headed back to the MoHo and turned in early as we were heading to Key West tomorrow for the next 15 days, one of our most anticipated destinations on our journey! p.s. Traci & I want to wish you all a Happy New Year! May 2014 be a great one! 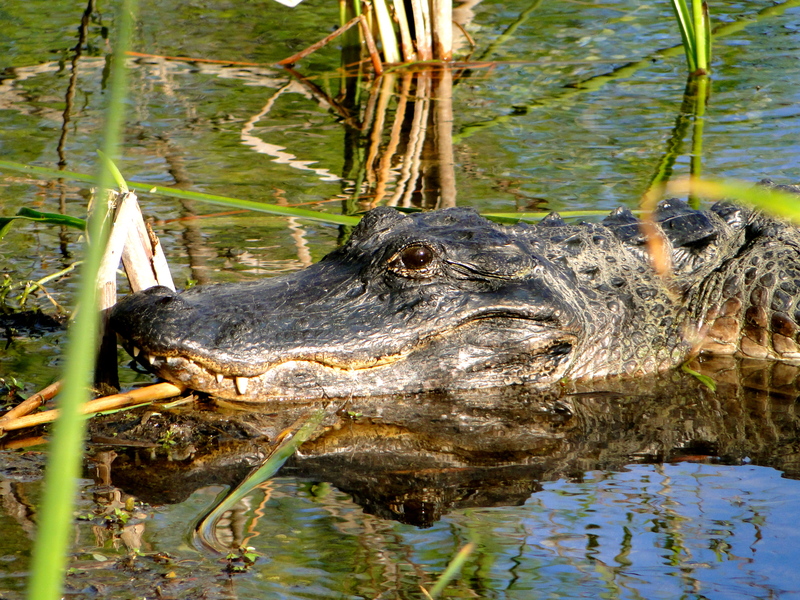 This entry was posted in January 2014 and tagged Alligators, College Football, Everglades, fishing, Florida, Ft. Myers Beach, New Years Eve, No-see-ums on January 7, 2014 by Mike.